Mummy-Tips: Hannah Montana wears patent DM's! Hannah Montana wears patent DM's! Fresh from the Hannah Montana movie and I must say that I was pleasantly surprised! 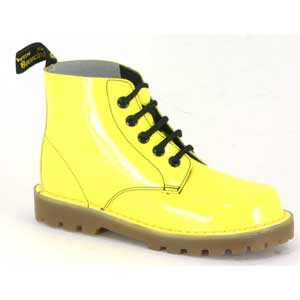 Hannah sports a pair of bright yellow patent DM boots in one scene - so on the Hannah tip I thought that I would share them with you all. My kids all love DM's. OK so it may have something to do with the fact that i love DM's (You simply can't beat the high heeled patent Darcy boots from last season) but they really are great shoes. Sizes from small 6 to 13. They are really versatile and look great with leggings, skirts or jeans. My middle daughter had a black pair for school and she loves them.